The DSB-200 Dual-View Digital Signage Processor with Audio Path is an advanced video processor with PC mother board built-in for digital signage applications. It is an ideal solution for applications where two video signals must be displayed on a single display, one from PC and the other from outside video source. It supports up to four video inputs, of which two can be outputted simultane¬ously in Picture-In-Picture (PIP) or Picture-Aside-Picture (PAP) modes. The DSB-200 allows you to manipulate output images, wherever position and whatever sizes you want for viewing two computers or two video signals or a combination. With MB support, users can upload popular OS such as Win7 or Linux to get a link to unlimited software and the instant Ethernet and USB support make DSB-200 access all the possible media content to enhance the presentation diversity. 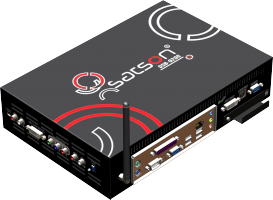 The embedded scaler converts signals from input sources to match the native resolution of monitors, flat panel displays, pro¬jectors as well as user-selectable output settings up to WUXGA (1920x1200). Dual outputs are provided in both analog (VGA) and digital (HDMI/DVI) format, one is connected to remote display and the other is connected to on-site display for real time monitoring or displaying. Titles, borders and colored backgrounds. Resize, position, flip, zoom& pan and blend output video. Can be cascaded to obtain more images. flash memory and can be recalled for later use. User-selectable output settings, up to 1920x1200.